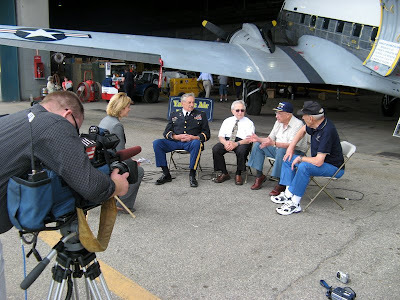 Pictured are OSS Radioman Arthur "Jibby" Jibilian in the white shirt, U.S. Airmen Curtis "Bud" Diles in the dark blue, short sleeved shirt, U.S. Airman Carl Walpusk in the uniform, and U.S. Airman Clare Musgrove in the white shirt, blue jacket. 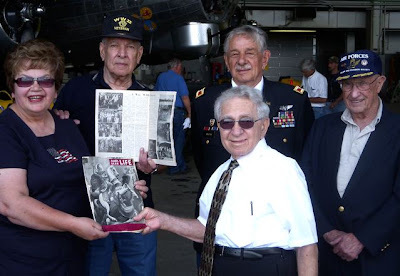 Jennifer Boresz is the interviewer and pictured with Arthur Jibilian and the airmen, holding the old "American Serb Life" magazine from 1948, is Milana "Mim" Bizic. The photos at the Yankee Air Museum were taken on June 23rd and 24th, 2008. The photos of Jennifer Boresz and her Emmy award were taken in June of 2009. All photos courtesy of Milana Bizic at www.babamim.com "Serbian History 101". 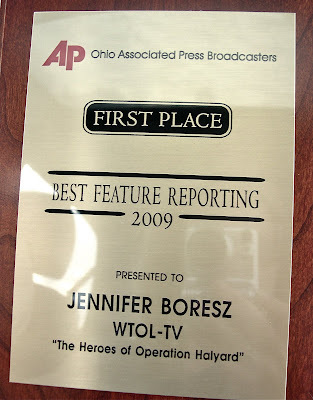 Congratulations to Ohio reporter Jennifer Boresz who this June of 2009 has just won First Place in the Best Feature Reporting category through the Ohio Associated Press Broadcasters awards for her July 2008 human interest story on the American veterans rescued by Serbia's General Draza Mihailovich during the WWII Halyard Mission rescue operation of 1944. The following is the July 2008 feature for which she received her First Place award. She has also been nominated for the local Emmy awards for the same story, and the winners will be announced in September of this year. The link to WTOL online will provide a video and photo slide show well worth looking at. 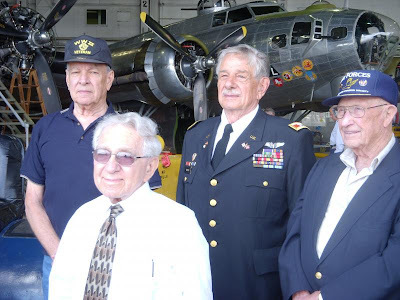 YPSILANTI, MICHIGAN (WTOL) - As we celebrate Independence Day, four veterans of World War II want to thank those who kept them safe in enemy territory years ago. 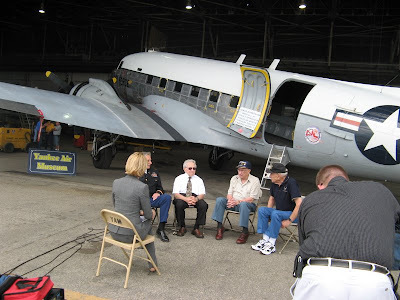 They were recently reunited at the Yankee Air Museum in Ypsilanti thanks to the Experimental Aircraft Association. News 11's Jennifer Boresz was there and has their story. These men are called the 'Forgotten 500' in a published book. As more and more people hear the story, however, they're hoping the daring rescue mission and the men behind it will never be forgotten again. "When they said pull that rip cord, I started to pull the ripcord like a lawnmower. It came up and came out in my hand. Then I thought, 'Now what do I do with this?,'" Curtis Diles, a WWII veteran from Dayton tells News 11. More than 60 years have passed since these U.S. airmen parachuted out of a plane into hostile territory. Clare Musgrove of St. Joseph, Michigan tells us, "I had the ripcord in my hand, and I was freefalling. I immediately tried to get into my pack and get the pilot chute' out. When I did, it made a much larger chute,' and my flight afterwards was OK."
Their mission was to bomb a German oil field. "We bombed Ploesti, so the Germans would be penalized for their lack of gasoline. But we paid one terrible price for that because the Germans knew what altitude we would come in," says Arthur "Jibby" Jibilian from Fremont. "They knew the formation we would come in. They had us zeroed in perfectly, and we were like sitting ducks." For many of these men, the mission was never finished. They died when their planes crashed into the treacherous mountains in the Balkans of Yugoslavia. For the others, they were parachuting into the unknown. Musgrove tells us, "On my way down, I saw a flock of sheep. When there's a flock of sheep, there's usually people around it. So I made up my mind that when I get down without being injured, that's where I was gonna head." They landed in German-occupied Serbia, but got help from Serbian resistance fighters led by General Draza Mihailovich, U.S. and British ally. "Those people had it pretty dog gone rough, and didn't have much to give. But they gave," Carl Walpusk of Moon Twp., Pennsylvania says. Those Serbians kept the U.S. airmen safe for weeks until the U.S. government got word of the 50 downed soldiers in Yugoslavia. The United States sent in OSS agents on a daring rescue mission known as Operation Halyard. Fremont's Jibby was one of those men who risked his life. "They asked if I would go as a radioman," he explains, "There wasn't even a heartbeat, and I said certainly." When he got there, he found not 50 airmen but 250. And the number was growing. "We stayed. What started to be a ten-day mission... we were there for almost six months and brought 500 airmen in." One-by-one C47s landed on a makeshift runway that the Americans and Serbs built by hand. "We were so pleased that these planes were coming in," Musgrove explains, "This is what we had worked so hard for... getting the airstrip built. It made us so happy." But when they returned to America, the government said they couldn't share their incredible story. "We weren't supposed to tell them how we got out. I think they wanted to keep that a secret," Walpusk says. These veterans feel the U.S. didn't give General Mihailovich credit for helping them. By the time the rescue happened, the U.S. and Britain had abandoned Mihailovich as an ally. They say false information was given that he was a traitor and collaborating with the Germans. The U.S. and Britain began siding with communist leader General Josip Tito instead. Jibby explains, "I don't know why the state department will not admit they made a mistake, that they abandoned Mihailovich. He was voted Man of the Year in 1941 in Time Magazine and hailed as a hero. Then they turned around and called him a collaborator simply to justify favoring Tito." When the war ended they say Tito put Mihailovich on trial, quickly found him guilty and executed him by firing squad. The hundreds of rescued airmen were devastated that they couldn't testify at the trial. "The only thing we ever wanted was to acknowledge that he did help us," Jibby says, "That the Serbian peopled helped us. That he was not a traitor. That we made a mistake in backing Tito. We backed the wrong man." In 2005 Jibby, Musgrove and a few other airmen presented Mihailovich's daughter with the Legion of Merit. It was awarded posthumously to her father by President Harry Truman. Jibby tells News 11's Jennifer Boresz, "I just want to say it's great being together with these guys again, and I wish the whole 500 were here today." Many thanks to you, Jennifer, for caring about this story and congratulations on the well deserved award for your fine reporting!